Five spice flavouring is a highly aromatic blend with a refined taste and aroma. Along with Chinese and Vietnamese cuisine, it came across tables around the world. It is characterized by the forest smell of cassia, combined with the aromas of anise. The spice of five flavours is used primarily in Chinese cuisine. It consists of five ingredients that are responsible for the sweet, bitter, salty, spicy and sour taste. Varieties of this flavouring are many, some of them contain ginger, coriander, galangal or fenugreek. 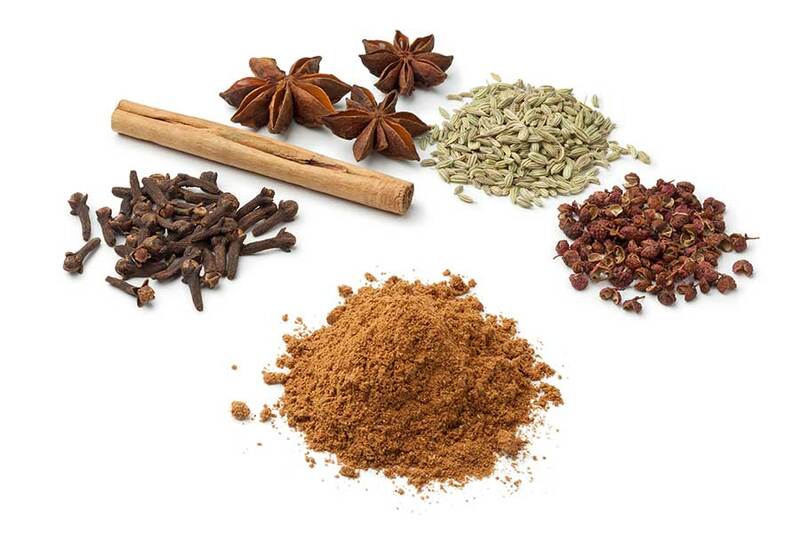 However, the most well-known composition consists of star anise, cloves, cinnamon, Sichuan pepper and fennel. 5 spice mix is used for various types of meats and fried vegetables. Anise goes very well with fatty meats, such as pork and duck. That is why these meats are usually marinated with five flavours, or stewed in a sauce based on this mixture.